This was originally going to be the last post in my 25th anniversary remembrance of Tiananmen Square through “Hymns of Social Justice” series, but since I got a little behind, there may be a couple more in some “afterword” posts. It all came to a head on June 3rd and 4th, 1989. 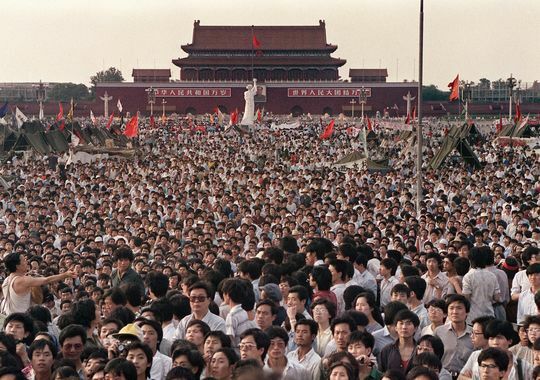 The protests that had started 6 weeks earlier in Tiananmen Square and had been peaceful and seemed to the world to be making some headway ended abruptly and violently when the government enforced the martial law that had been declared on May 20th and sent the troops in. Warnings were sent to citizens to clear the streets, some people went in doors but most of the protestors stayed. Soon the tanks rolled in followed by the soldiers. This of course, gave the most iconic image of the protest, that of “Tank Man” who first dared to stop a tank column by simply standing his ground in front of them and daring them to run him down. Then he climbed onto the tank and had some sort of conversation with the driver. What I would not give to know what he said. I like to think that it was something to the effect of “WHAT IN THE HELL IS THE MATTER WITH YOU! These are your brothers and sisters that you are about to run down. Your countrymen! They are standing up for your rights as well as theirs! For the love of God think about what you are about to do!” OKAY, that is probably nothing like what he said, which I am sure was more peaceful and civil, but that is how my mind works. The impetus for this series came in a Facebook discussion with Sunstone friend and all around nice guy Brad Kramer. He reminded me that when the message came to the students that the tanks were starting to roll in that they prepared themselves for what was coming and for what they knew would be their last stand by singing that great labor rights song “The Internationale”. It was that conversation coupled with a statement by Billy Bragg that got me curious to know what songs had been inspired by Tiananmen Square. On May 3, 2009, some of the greatest living Folk singers gathered to honor the man who was then THE greatest living folk singer, that hero who recently left us, Pete Seeger. It was his 90th birthday and his friends honored him by holding a benefit concert in his name with the monies raised being used to help clean up Seeger’s beloved Hudson River. A who’s who of folk and civil rights singers and some liberal minded actors were there to honor the man who had inspired them so much. They sang Seeger’s songs or songs that he had popularized and told stories about their experiences with him. « Why aren’t we outraged? Power to the people, Andrew! Is this by change Andrew Howell? I should…but it might be awhile before I get to that.